The 2GIG system is a state of the art control panel. This system offers burglary, medical, fire and environmental protection. This is the most user friendly system available right now. This system has full voice response to give clear notifications that indicate system status, zone descriptions and alarms. It is easily expandable. This system is so sophisticated that it can be also used in a finished home where it is difficult to wire traditional hardwired sensors without giving up anything over a standard hardwired system. As a matter of fact, is better in the sense that there are no wires to cut so it can be even more secure. It is totally wireless so it’s easy to move to another location. This system has a built-in cellular module so no telephone land line is required. 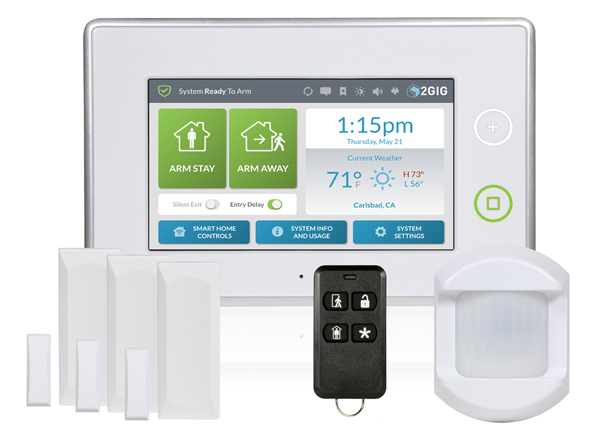 This system can be monitored and controlled via a smart phone or a computer. With its built-in home automation capabilities, you can control thermostats, lights, locks and plugged-in appliances even when you are away from home. This system is very versatile and powerful for a very reasonable price. Contact us for equipment options, installation, monitoring plans and pricing.